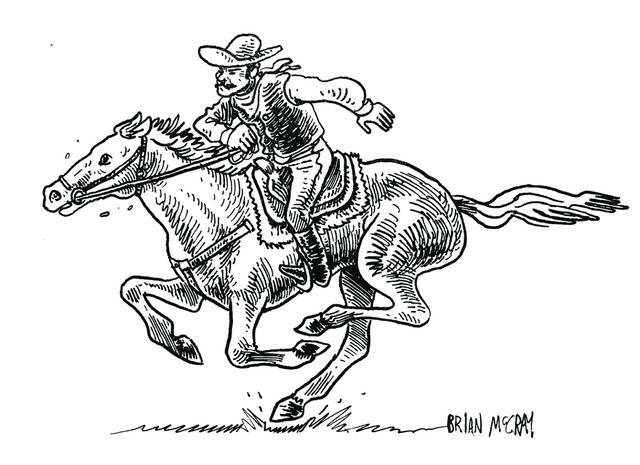 Editor’s note — Over the past few weeks, we’ve been bringing back traditional newspaper fiction with “Long Ride from Split Rock,” a dime store cowboy yarn by David Wright. Previously: A cowboy and an aimless drifter join each other in a slow walk for San Francisco to deliver a fated letter. But trouble lurks in the burning hills of Arizona. Ashley Quincannon awakened suddenly, coughing dirt and blood. The drifter couldn’t see out of his right eye for the swelling, and dried blood blocked his vision in the other. His head felt like it had been hit with a mallet, and his skin burned. He blinked with his good eye and looked around slowly, gasping for air. The sun was high overhead, a long way from setting behind the canyon wall that rose from the dust a stone’s throw away. There would be no relief from the burning heat for some time. Quincannon tried to lift his hand to scratch his eye, but found it could not move. He wriggled his toes, and they moved in his boots, but his legs would not budge. He craned his neck to look around and his neck was all that would cooperate – the rest of his body was paralyzed all the way down. Quincannon panicked and began coughing again, and his head throbbed hard. He remembered nothing. A ring of buzzards gathered in the sky overhead and a handful more sat hunched on the ridge nearby, their feathers dusty and matted. They had the look of animals that had been waiting and now knew it wouldn’t be long before their next meal. How long had he been here? Where was he? The questions swirled in Quincannon’s mind and he felt himself slipping away. The last thing Ashley Quincannon saw before losing consciousness was Jim Reed’s dismembered head lying in the dust next to him. And now he was riding, riding, faster than he had ever ridden, and the Blackfoot were still on his tail, whooping and hollering in his ears as his pony’s hooves beat snow. An arrow whistled by his head and he whipped his ride harder up the hill. Dark clouds gathered above as he reached the top of the rise, and the howling wind blew his hat into the wash below. He had no choice but to plunge into the canyon before him. The sagebrush whipped against his chaps and his pony frothed and panted as it careened down the hill. When he hit the bottom of the dip, the animal struck its hoof on a rock and threw him to the mud in a cloud of envelopes. The Blackfoot stopped on the ledge, knowing they had him caught. He crawled around in the snowy slush at the bottom of the wash, grabbing at the letters in a panic. When the Indians began a slow descent into the canyon, eyeing the letters, he stood up, drew his revolver and bellowed for them to come and take them. But Quincannon knew that wasn’t how the night had really ended. The vision replayed, this time as true and ugly and real as it was when it happened all those years ago. He set off in the morning from the Fort Bridger Post Office with a full load of certified Pony Express mail bound for Sacramento, though his route ended well before then. He planned to be back in town by Friday for a drink with the pretty blonde girl he’d been seeing, but he never returned, because the Blackfoot indeed caught up with him somewhere along the way, and he ran his pony hard until she could hardly run anymore. But this time, when he reached the bottom of the wash with the Blackfoot nipping at his heels, he tossed the mail bags to lighten his load, gunned the pony hard, and never once looked back. The minute the leather straps slipped from his hands, he knew the sin he’d committed. When he rode slow into Sacramento, beat by the sagebrush and dog tired, they demanded he pay for the letters he’d lost. He ran, and he’d been running ever since, lost as the letters he’d thrown away. Jim Reed’s voice echoed in his head suddenly. “That buzzard’s gonna have your scalp if you don’t wake up, greenhorn,” he said. Quincannon awakened eye to eye with one of the big birds, and his coughing and cussing scared it away for a moment. The sun hadn’t yet set behind the canyon wall, and Quincannon felt the sting of sunburn on his forehead. He looked over at Reed, and Reed’s head looked back at him. Both men were buried neck-deep in sand at the bottom of the canyon. Quincannon’s right eye had swollen completely shut and his lip was busted, but Reed had received the worse end of the deal – a long, deep gash traced along the side of his head, swollen and crusted with dirt and pebbles. It was the grim work of an Apache raiding party of a dozen braves, and while the encounter was violent and painful for the two white men, not a shot was fired in the whole ordeal. The Indians had surrounded Quincannon and Reed in the bottom of the canyon at high noon, and before Reed had a chance at communicating – he knew a little Apache – Quincannon had drawn his revolver, and they were done for. They were down from their horses and on the ground getting clubbed in an instant. Only Reed stayed conscious for the beating and burying, until a lanky brave slashed his head with a long knife and he passed out from the bleeding. Both men were lucky to be alive, but Quincannon figured they wouldn’t stay that way for long. Jim Reed had different ideas. When he was rested enough, Reed began to writhe in the sand, the muscles in his bruised neck bulging as he worked his hands and feet in the dirt. Dried blood that had crusted over his wound busted loose and he began bleeding again, but still he struggled. Quincannon shouted to keep the buzzards at bay, and Reed twisted and squirmed as the sun sank lower in the sky. By the second hour, he was free, and he dug Quincannon out with his hands. The two men set out due west again, limping and nursing pounding headaches. The horses and guns were long gone. They walked for two days, and by a stroke of dumb luck, they stumbled upon a spring in a canyon where they drank deeply and washed their wounds. Quincannon’s eye remained shut and he figured it would stay that way. Reed was delirious. His wound had quit bleeding, but it was grossly swollen and showed the beginning signs of infection. After a little sleep in the shade of an overhang, Quincannon awakened, and he sat on a rock for a long time and thought, stomach growling, head pounding. He picked at his eye and took a long drink from the spring. Then he thought some more, stroking his mustache. They needed guns and horses, no matter how hard they might come, and Reed needed medicine in a bad way. Quincannon was sure they were out of Apache country by now, but there were no signs of cattle trails or settlements. In the middle of the night, Reed mumbled something, and Quincannon crawled over to him. The cowboy coughed and rose slightly, reaching into his vest with a bloody hand. He pulled out the letter. It was crinkled now and smudged with dirt and dried blood. He placed it carefully in Quincannon’s hand. Quincannon silently tucked the letter into his back pocket and held Reed’s hand. His heart sank. It was a shame a man like Reed could escape being hanged and buried just to die like a rat in the desert. Quincannon lay flat on the ground with his ear to the dirt. Minutes passed. There was no sound. Minutes turned to hours, and he stayed in the prone, eyes closed, straining his ears… and there it was. A low rumble, not too far off. Four horsemen, maybe five. Dumb luck. Using the last of his strength, Quincannon clawed his way to the top of a nearby rise and saw salvation on horseback. With the sun slowly rising over the mesa came a group of men riding toward him not five miles away, and behind them, a wagon train of five green Conestogas, rolling slowly due west. For the thrilling fifth installment of “Long Ride from Split Rock,” click here.